Directed by Moore himself alongside Ross Stewart, ‘Wolfwalkers’ follows a young apprentice hunter, Robyn, who comes to Ireland with her father to wipe out the last pack of wolves. However, when Robyn saves a wild native girl, Mebh, their friendship leads her to discover the world of the Wolfwalkers and transform her into the very thing her father is tasked to destroy. ‘Game of Thrones’ actor Sean Bean is attached to narrate the newest animated film from the multi-Oscar nominated Kilkenny-based company, whilst the story was written by Will Collins and Tomm Moore. This announcement has come in the wake of Apple’s push towards backing original new content. The tech giants, who are reportedly set to unveil their own streaming platform, have acquired documentary, ‘The Elephant Queen’ and is also backing an original animated show called ‘Central Park’, about a family of caretakers who live and work in the eponymous park. Cartoon Saloon, founded in 1999 by Tomm Moore, Nora Twomey and Paul Young, has received three Oscar nominations for Best Animated Feature in years gone by. 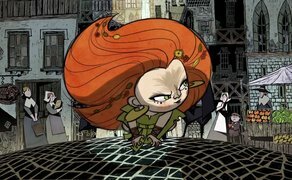 ‘The Secret of Kells’ received a nomination in 2010, whilst ‘Song of the Sea’ picked up a nomination in 2015 and more recently ‘The Breadwinner’, produced by Angelina Jolie, was nominated in 2018. In addition to its animated features, the studio’s Emmy-nominated preschool series, ‘Puffin Rock’, is streamed globally on Netflix. The company is also working on a television co-production with Disney called ‘VikingSkool’, which is due to air next year.